Sandstrom, Gregory. “Steve Fuller’s False Hope in IDism: The Discovery Institute’s Anti-Transhumanism.” Social Epistemology Review and Reply Collective 4, no. 10 (2015): 1-7. While I have been gradually working on a couple of other articles related to SERRC posts (Frodeman 2015 and Eglash 2015) that challenge Steve Fuller’s embrace of ‘Intelligent Design’ (ID), this one is the easiest to finish due to the starkness of the problem. The Discovery Institute (DI), home of the Intelligent Design Movement (IDM), has been beating its anti-trans-humanism PR drum in recent years. Fuller, on the other hand, has made pro-trans-humanism into one of the main topics of his recent work, indeed calling it now a “full-blown ideology” in his and Lipinska’s The Proactionary Imperative (2014, v). According to the DI, proponents of ID (who I label as ‘IDists’) are pioneers of a new ‘scientific revolution.’ For them, according to DI staff member Kelly Unger, “The idea that there is design and purpose in the Universe truly has the power to change our society in ways that are greater and further reaching than the Industrial Revolution.”  Yet, the DI does not yet seem willing to explore ‘designing’ for human enhancement or human extension through the utilisation of new technologies. Such activities can be seen in the already beginning and steadily oncoming robotics era or ‘Artificial Intelligence Revolution’ as some are boldly calling it. In his SERRC paper “Science without Expertise: Defending My Defence of Intelligent Design (Nearly) a Decade Later,” (2014) Fuller speaks of “ID and Trans-humanism.” Yet he obviously does not have the DI’s version of ID in mind when he links these two notions. Instead, Fuller has a significantly different view of ‘intelligent design’ that he is proposing, which I call cybernetic-ID (forthcoming 2015). Onlookers might wonder how or if Fuller confronts the anti-trans-humanism of the DI or if he has found some way to distinguish their IDism from his own social epistemology. This article puts Fuller’s trans-humanism and the DI’s anti-trans-humanism in sharp contrast. The DI is fiercely and conservatively against trans-humanism. If Fuller wants to promote ID, trans-humanism and his so-called ‘new eugenics,’ then it would help if he distinguished his position from the politically entrenched leaders and fellows of the DI. Not to do this serves only to confuse IDists who rant against human enhancements and human-technology ‘uplift’ with Fuller’s starkly different vision for the future. This is perhaps most severely stated in what Dr. Michael Egnor says of trans-humanists displaying “shades of Mengele.” For the DI, Fuller’s trans-humanist eugenics is a dangerous threat to humankind, not just in the USA, but globally and people like Fuller are comparable to Joseph Mengele (German ‘angel of death’ doctor in Auschwitz) and therefore best removed from polite society. The DI’s most active anti-trans-humanist is Wesley J. Smith, who in contrast to trans-humanism promotes the notion of ‘human exceptionalism’ as consistent with his Catholic faith (more below). Smith writes that “Trans-humanism is a cheap way to excellence—which isn’t excellence.”  Smith even tries to re-name trans-humanism as ‘minushumanism’, given his view that with trans-humanism and generally in the current epoch, human beings are “becoming solipsistic machines.” This type of reaction to trans-humanism has come up at SERRC previously expressed in Robert Frodeman’s concerns. Frodeman frames Fuller as a man (not just a public intellectual or scholar) interested in self-deification through proactionary trans-humanism. Fuller’s recent works, says Frodeman, “offer a historically and philosophically literate defense of what has been the largely unacknowledged end of our technological society: self-deification.” Without at first addressing whether or not that accurately represents Fuller’s view, I wonder who (other than supposedly Fuller) Frodeman thinks specifically interprets this as ‘the end’? Would Frodeman expand on his thoughts here? I am doubtful if Fuller has actually written this about ‘technological society’ rather than it being merely an imaginative projection from Frodeman. Is Frodeman only faulting Fuller for pretending to be the ‘god’ that he himself is not? One alternative to self-deification, of course, would be self-belittlement or personal ‘disenchantment’ (not to say anything about the embrace of radical skepticism or cynicism). Fuller has recently breached the ‘zombie’ question, which could perhaps also fictively apply. Would it not suit Frodeman to give Fuller the benefit of the doubt that his texts are meant to be future-conditioning and empowering for humanity, rather than either blasphemous or fatalistic in the post-humanism sense? Nevertheless, there is a historical precedent which Fuller is likely aware of, that Frodeman might consider in the realm of theology, if he would allow it. Thomas Aquinas wrote, “[I]t is clear that to become like God is the ultimate end of all.”  Is Frodeman suggesting that Fuller is actually trying to become ‘a god’ or rather simply ‘like God,’ consistent with historical Christian teachings, in whatever way Fuller conceives or perceives the deity? It would be helpful for Frodeman to clarify his precautionary charges against Fuller on this topic because ‘trans-humanism’ holds many sometimes inconsistent meanings and it doesn’t seem Frodeman is yet hitting the mark of Fuller’s program. Does Fuller actually think he is a ‘god’? I don’t know. He does not help himself any favours when he does things like a Twitter conference on “How to think like God” on Christmas day. A so-called ‘visioneer,’ seer or even a prophet, of course, is still not a ‘god.’ And one is best reminded of the many false prophets who have laid claims to divinity only resulting in their own peril. When we read Fuller’s version of ‘trans-humanism’, we must nonetheless remember that it is at its deepest root framed within a Unitarian worldview. Since writing in 2008, “I am a secular humanist who has been steeped in the historical and philosophical relations between science and religion since my school days with the Jesuits” (2008, 8), he has more recently stated his worldview as a “non-conformist Christian” Unitarian (2014, 7). “By ‘Unitarian’ we mean the idea that each person’s connection to the original creative deity is direct and personal,” Fuller writes. “Unitarians believe that we ‘always already’ have God within us but perhaps not the means to realize our divine potential.” (2014, 5) Thus, in seeking to reach his divine potential, we see Fuller identifying his position as having closer affinities with Ray Kurzweil, Norbert Weiner and Herbert Simon (all of whom are/were more commonly considered as Jewish atheists or agnostics than mainstream Unitarians), rather than with (non-Jewish) atheist trans-humanists like Zoltan Istvan or Nick Bostrom. There are notably other non-Unitarian theists who also discuss and even promote trans-humanism, e.g. Ted Peters and Carl Teichrib that Fuller does not appear to endorse. This raises an important question regarding ‘human exceptionalism’ that I have not yet seen resolved in Fuller’s writing. On the one hand, he promotes the Unitarian and generally Abrahamic theistic position that designates human beings as spiritual creatures “made in the image and likeness of God” (2014, 7), which is commonly understood as ‘exceptionalist’ (or at least, acknowledging a difference in ‘kind’, not just ‘degree’ from other creatures). Yet, on the other hand, Fuller seems to actively want to erase ‘human exceptionalism’ even agreeing with the un-exceptionalism of Darwin. This can be seen in his contribution “Human Being=Homo Sapiens” at Edge, in which he speaks about the ‘uplift’ of ‘candidate beings’ for an ‘expanded circle of humanity.’ So, from one side while Fuller’s view seems compatible with Smith’s (and most other DI Fellows), his trans-humanism comes across from the other side as indeed anti-‘human exceptionalism’. It would be helpful if Fuller clarified what appears to be a contradiction in his position. “We believe that the original motivation for the West’s Scientific Revolution,” say Fuller and Lipinska, “the radical version of Christian self-empowerment championed by the Protestant Reformation—remains the best starting point for motivating the contemporary transhumanist project” (2014, 45). Is this intentional attempt to blur the difference between human beings and other creatures as one of ‘degree’ rather than ‘kind’ a neo-Protestant theological position? Thus, while Fuller’s view of ID  aims to be compatible with the idea of (intelligently) “redesigning the human condition” as stated in the UK’s Transhumanist Declaration, in contrast the DI does not focus on proactively ‘designing’ at all because it claims one simply cannot discuss the ‘designer/Designer’ within its ‘strictly scientific’ theory. It also seems to be rather confused over the difference between ‘trans-humanism’ and ‘post-humanism,’ the latter which Fuller does not appear (so far at least) to be promoting. What we therefore see in the PR and rhetoric of the DI is a kind of fear and precautionary trembling about post-humanism that comes across as somewhat similar to Frodeman’s anti-Fuller approach at SERRC. The DI seems to be defending a backwards looking static view of humanity, which makes trans-humanism simply impossible. All that is holding up the coming AI revolution is some specific leap forward in human technology, in solving ‘key problems’—that is, in intelligent design. It’s not robots that will solve the problems, much less mindless, material, unguided natural forces—but, obviously, scientists. A major problem for Klinghoffer is that this simply isn’t the kind of lowercase ‘intelligent design’ (i.e. by known intelligence) that the DI focuses on, i.e. the designing and manufacturing of artefacts and technologies. Klinghoffer is speaking here of human-made cybernetic-ID, rather than the neo-creationist apologetics (origins of life, cosmogony, human origins, etc.) that regularly comes out of the DI’s IDism. This displays a kind of double-talk by Klinghoffer that Fuller’s trans-humanistic approach strategically avoids. Similar to Klinghoffer, Smith employs a policy typical of IDists affiliated with the DI. He chooses one or a few ‘easy targets’ and then exaggerates their importance and influence as if they speak for so many others, when in fact they don’t. And he intentionally ignores inconvenient voices that reject IDism, while exaggerating his claims. Smith, for example, typically does not address proponents of trans-humanism who share his theology/worldview and states that “Transhumanism embraces materialism with white-knuckled fervor” (2012). What would Smith do if he were to face non-materialist Christian trans-humanists like David Winyard, Christopher Benek and Micah Redding? How would he confront the Mormon Trans-humanist Association? We have become conditioned to expecting what has become common practise at the DI: ideological duplicity and double-talking. The DI wants to appear as a champion of generally monotheistic religious people, while at the same time insisting that IDT is a ‘strictly scientific’ theory. Fuller sees through this duplicity and double-talking, as do I. The relationship between the DI and Steve Fuller thus comes across as something like ‘the enemy of my enemy is my friend’ rather than being a productive or fruitful collaboration. Sure, Fuller has written for DI-funded publications, e.g. the Foreword “Beyond Naturalism to Science” for The Nature of Nature (ISI Books, 2011). But the DI does not actively promote Fuller’s works in its right-wing political, neo-creationist network and funding channels in the USA. Frodeman should at least be aware that Fuller is not as ‘intertwined’ with the DI (nor supportive of their right-wing conservatism, that part should be obvious) as he and some other people seem to think. It nevertheless appears that the DI recognises what Fuller still may not; their vision of ID is fundamentally different from his. The DI certainly will not be promoting or advocating Fuller’s proactionary imperative or humanity 2.0 anytime soon, even while they gave lip service to his earlier works on ID, science and religion. Most recently, Smith has just this month published a scathing, half-mocking critique of Fuller’s trans-humanism in National Review, in response to such claims by Fuller (2015) as: “If you’re a transhumanist, ordinary people are zombies … They are programmed for destruction—not genetically but intellectually.” In good humour, Fuller responded in the comments section to Smith saying: “Why not demonize me for being an intelligent design supporter, instead? )” The irony, of course, is that Smith knows Fuller does not actually promote ‘his kind’ of IDism, but rather Fuller’s own Unitarian cybernetic-ID, so there is no need to demonise him for that. With dismissive friends like Smith, Fuller does not need thoughtful ‘anti-Fuller’ enemies. Does Fuller actually think that the DI will ever come around to accept his forward-looking definition of ‘intelligent design’, one that openly and honestly acknowledges an obvious debt to social epistemology and theology/worldview? Why does he not finally set the record straight by distancing himself from the DI and its plentiful precautionary ideologists like Smith, even as he makes himself clear about ‘human exceptionalism’? If Fuller were to publically distance himself from the IDM and the DI, SERRC would likely approve across the board of his clear disassociation. On the other hand, if Fuller wishes not to distance himself, but rather somehow to move himself closer to the DI’s precautionary IDism, how can he reconcile his pro-trans-humanism with the DI’s anti-trans-humanism? Right now, Fuller seems to display a kind of false hope in IDism, not wanting to openly criticise IDists at the DI who have given him a pretty, provocative ideology to behold, while loathe to publically embrace them either. Egnor, Michael. “Now Head Transplants? Onward and Upward with Trans-humanism.” 2015. http://www.evolutionnews.org/2015/02/now_head_transp093981.html. Frodeman, Robert “Anti-Fuller: Trans-humanism and the Proactionary Imperative.” Social Epistemology Review and Reply Collective 4, no. 4 (2015): 38-43. Fuller, Steve and Veronika Lipinska. The Proactionary Imperative: A Foundation for Trans-humanism. Palgrave Macmillan, 2014. Fuller, Steve. “We May Look Crazy to Them, But They Look Like Zombies to Us: Trans-humanism as a Political Challenge.” 2015. http://ieet.org/index.php/IEET/more/fuller20150909. Fuller, Steve. “Human Beings=Homo Sapiens.” In Edge’s Annual Question: “What Scientific Idea is Ready for Retirement?” (2014a). https://edge.org/response-detail/25396. Klinghoffer, David. “A ‘Cambrian Explosion’ in Robotics?” 2015. http://www.evolutionnews.org/2015/09/a_cambrian_expl098951.html. Peters, Ted. “H-: Trans-humanism and the Posthuman Future: Will Technological Progress Get Us There?” Metanexus. 2011. http://www.metanexus.net/essay/h-trans-humanism-and-posthuman-future-will-technological-progress-get-us-there. Peters, Ted. “The Future of Trans-humanism as a New Religious Movement.” 2014. https://www.youtube.com/watch?v=FLHnEM6B3hA. Smith, Wesley J. “The Trans-humanists.” 2002. http://www.discovery.org/a/1261. Smith, Wesley J. “An Epistle for the New Religion of Trans-humanism.” 2005. http://www.discovery.org/a/2384. Smith, Wesley J. “The Trouble with Trans-humanism.” 2011. http://www.discovery.org/a/17311. Smith, Wesley J. “Christian Transhumanism is an Oxymoron.” 2012. http://www.firstthings.com/blogs/firstthoughts/2012/04/christian-transhumanist-is-an-oxymoron. Smith, Wesley J. 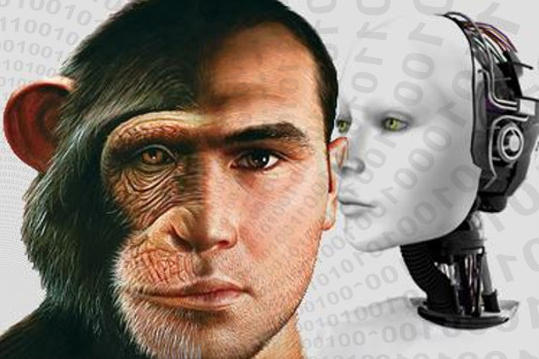 “Trans-humanism’s Eugenics Authoritarianism” 2014. http://www.evolutionnews.org/2014/08/trans-humanisms089001.html. Smith, Wesley J. “Give Me That New Time Trans-humanism!” 2014. http://www.evolutionnews.org/2014/12/give_me_that_ne091591.html. Smith, Wesley J. “AI Machines: Things not Persons.” 2015. http://www.firstthings.com/web-exclusives/2015/04/ai-machines-things-not-persons. Smith, Wesley J. “Trans-humanism’s Despairing Howl.” 2015. http://www.evolutionnews.org/2015/05/trans-humanisms_2096331.html. Smith, Wesley J. “Trans-humanism is really Minushumanism.” 2015. http://www.evolutionnews.org/2015/08/trans-humanism_i098461.html. Smith, Wesley J. “Do Trans-humanists want Realists Dead?” 2015. http://www.nationalreview.com/human-exceptionalism/423774/do-trans-humanists-want-realists-dead-wesley-j-smith. Teichrib, Carl. “A Conservative Christian Critique of Religious Trans-humanism.” 2013. https://www.youtube.com/watch?t=130&v=VFxDVZjyjeE. Wiker, Benjamin. “From Darwinism to Trans-humanism.” 2003. http://www.discovery.org/a/1910. “I always present the intelligent design (ID) movement to students as a vehicle for promoting a progressive, post-Darwinian understanding of biology.” — Fuller (2014). Summa Contra Gentilles, Book III, Chp. 20. Given how stubborn such people are on LGBTI issues, it’s pretty difficult to see how they’ll ever be brought around to a progressive transhumanist agenda. The first thing to say is that Gregory Sandstrom’s analysis of the relationship between my version of ID and the Discovery Institute’s version of ID, as well as the relationship between the two different versions of ID and transhumanism, is correct. Moreover, anyone who has taken an interest in these matters should not be surprised by anything he says. The provocation lies in his suggestion that I should do more to distance myself from the Discovery Institute’s version of ID. My basic response is that I’m not sure what good that would do, given that anyone who follows these matters can already see exactly the points that Sandstrom is making about the differences between the versions of ID. As a matter of fact, on the ID blog Uncommon Descent, both Sandstrom and I have had arguments with ID defenders whose views are like those of the Discovery Institute. Thus, we have argued that ID is pretty vacuous as a positive research programme if it doesn’t take the nature of the designer seriously, even though that means making ID’s theological assumptions explicit. However, as Sandstrom notes, it remains a key tenet of the Discovery Institute’s strategy to promote ID exclusively as what it calls a ‘scientific theory’, by which they mean a metaphysically neutral version of a scientific theory, which in turn amounts to little more than registering patterns in the evidence – and hence ‘design’ in that rather weak sense of the term. The theory may be called ‘intelligent design’, but according to the Discovery Institute there is little or nothing one can say about the ‘intelligence’ behind the ‘design’. Small wonder that, then, ID gets accused of disingenuousness. However, it seems to me that as long as there remains in place (especially in the United States) the taboo that forbids the discussion of theological matters in the context of science, it will be difficult to give ID a fair hearing. In this respect, the Discovery Institute enforces the taboo just as much as its naturalistic opponents. I find it regrettable, but I also think that anyone who has been following my contributions to ID will recognize that I am very explicit about the theological character of ID. Moreover, I think that my version is truer to the history of ID, which reaches back into 17th and 18th century natural theology and theodicy, in which matters of science, religion – and morals – are quite explicitly intertwined. And the morals associated with ID historically have not been those of Wesley Smith or, say, the conservative Christians who supported the precautionary conclusions of George W. Bush’s bioethics panel. Rather, even an ID icon such as William Paley was an early supporter of Malthus and is normally seen in the history of philosophy as a founder of utilitarianism. My guess is that a sense of this history is why relatively few conservative Christians openly embrace ID as a positive research programme, though no doubt many see it as a fig leaf for other forms of creationism, as was demonstrated in the Kitzmiller v. Dover case. Instead, ID is largely invoked as a foil against Darwinian evolution, if not all accounts of evolution. And the Discovery Institute seems satisfied with that state-of-affairs, even though at most ID is assured only a stalemate, not a substantive intellectual victory. I find the situation just as frustrating as Sandstrom does, but I don’t have a substantive interest in reorienting the Discovery Institute, which after all I have never been even invited to join. Sandstrom is right to say that my attitude here is that of “My enemy’s enemy is my friend.” Now Sandstrom (and others) may think I am too relaxed about all this. My own reckoning is that any distancing from or criticism of the Discovery Institute would accomplish little from the standpoint of my detractors because what they really don’t like is the very idea that science and religion might be intertwined, about which I am actually much more open than the Discovery Institute. Instead I think time is better spent tackling matters from the other end: namely, ensuring that transhumanism doesn’t become an offshoot of New Atheism. This is also intellectually quite challenging but potentially more rewarding, since transhumanism is not so closely tied to one propaganda machine and hence remains very much, so to speak, an ‘open source’ movement. Moreover, even if most self-declared ‘transhumanists’ appear to be atheists, they also tend to hold rather exotic, often millenarian views about science and technology’s capacity to upgrade the human condition. So a theological pulse of sorts is detectable not far below the movement’s surface. Finally, as for my views on ‘human exceptionalism’, which Sandstrom has puzzled over in the past, I have recently said more about this in a theological defence of ‘ecomodernism’, which may be found here: http://www.abc.net.au/religion/articles/2015/09/29/4321467.htm. My basic position is that humanity may have begun as Homo sapiens but need not remain Homo sapiens. In the end ‘human’ is a normative category which needs to be stripped of its residual species essentialism.